What does this distance signify? I am not able to decipher it. When did this light from that galaxy actually get emitted for its travel towards the Earth? This distance from us today is probably in the 30 some billion light year range. At that time universe was just around 400 million years old. Since the expansion during that epoch was not faster than light speed, so the size of the universe could not have been more than 800 million light years. In that case for example a photon emitted on one extreme could have reached the another extreme in around 800 million years + additional time taken to cover the expansion. How could it travel 13.3 billion years? 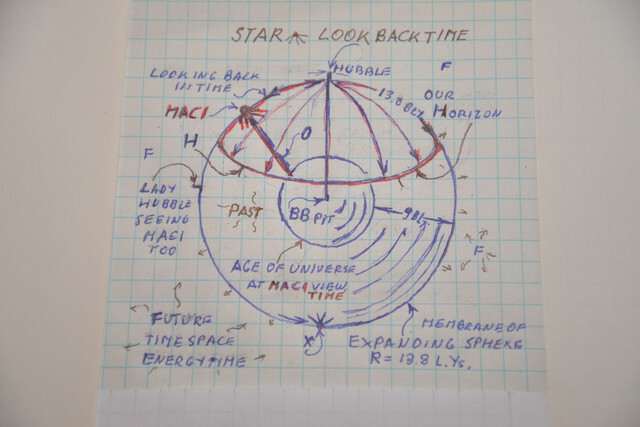 Hayden: Here is a sketch from the "ALMA" thread in the "alternative theories" forum that started out with you here in "amateur astronomy, cosmology" . The light started at #7, when the universe is smaller, then, on the photon path #0 has traveled to # 5, the location of today's observer, but as seattle said, the galaxy has moved on, as the universe expanded to be at #6, or even# 12 ~ 30 billion light years away, up to 1/3 away from the total size of the universe. The universe has gone through time, for 13.8 billion years, how fast. and how far, is still under scrutiny. Partially discussed through 17 000 views in the ALMA thread. It is same as your question. here is another relevant sketch from the "ALMA" thread. AlMA is a radio telescope capable of receiving older stretched wavelength, your images were from visible light instruments, all remarkable work. It's been 13.3 billion years since it was formed. That's the point in time we find our-self at presently on Earth. Any light emitted just after the Universe was formed, just reaching us now, has traveled for that long. As far as the distance it traveled, that depends on the size of the Universe. Inflation (just before the Big Bang) resulted in accelerated expansion much faster than the speed of light. By the time inflation was over (fraction of a second) the Universe was already at least as large as our present Observable Universe. The first part of your question seems to imply that there was a flash of light that then stopped shining. That early galaxy formed 400 million years after the Big Bang and we have just now managed to view it (for various reasons including gravitational lensing). The light that we are currently looking at would have to have been traveling for 13.4 billion years because that's how old it is. As far as the distance it traveled, that depends on the size of the Universe. Inflation (just before the Big Bang) resulted in accelerated expansion much faster than the speed of light. Is not the inflationary period thought to have happened after the Big Bang? and no matter how fast the expansion's speed, the age is fixed, the size of the universe depends on the rate of expansion, and we can see only 1/4 of it. Hayden, the source of the light in question, could now be beyond the horizon. There are two 'big bangs' in common use. The first is the so-called singularity event at t ~ 0. The second and usual one is the hot big bang that followed the end of inflation as per standard model. No, but that's a common misconception and a sometimes misuse of the terms. It's not true that "we can only see 1/4" of it. The Observable Universe is the part that we can theoretically see. The Universe itself is unknown. It may be finite, it may be infinite but due to its "apparent" flatness, there are some calculations that say it must be at least 250 times larger than what we can observe. In this sausage model of the universe, you mean to say, as you said, that the inflation happened before the big bang? before the beginning? perhaps that the Big Bang was not the beginning? What is causing further confusion is the varied statements about the spatial size of universe at the end of the inflation. Some says it was just of a few millimetres and some say it was almost of present day size. If after the inflation universe was of almost present size, then the OP poses no problem. The Big Bang is not the beginning. As you can see from the model, inflation comes just before the Big Bang. Inflation comes just after the "beginning", so that a singularity doesn't have to be addressed. So, according to this model "we" don't know the physics of the actual beginning. This is a matter of semantics however since the difference in time between the beginning and inflation is just a fraction of a second. It's just a way of saying we don't know what we don't know. Space and time, in this model, did begin with the Big Bang. The confusion, I think, is in the way terms are used. Most physicists, when they speak of the Universe, are actually referring to the Observable Universe. The actual Universe was much bigger. My understanding, is that, due to inflation, space was "immediately" "large". The way to think of it is that things have change over time. The Universe is now larger, less dense and cooler therefore immediately after the Big Bang the Universe was hotter, denser and smaller. Space and time, in this model, did begin with the Big Bang. nothing, even inflation , can be really said to have happened before* it all began?. also, the casing of the sausage is bracketed by Big Bang Expansion, right up to the present, so, in this rendition, is the Big Bang not over yet? *some, wrongly will even argue there was no time period, for anything, let alone inflation, to transpire before the big bang beginning. If after the inflation universe was of almost present size, then the OP poses no problem. The problem is not this gravity lensed single image of the OP. . The Elephant in the room is, that the further we look back everywhere, the universe appears to be packed tighter and tighter with galaxies. (see deep Hubble images) so: we are supposedly looking at a bigger sphere than our neighbourhood, but it is more crowded than here. . Going back to the Alma sketches above: The light we see comes to us in a spiral pass, from a younger, smaller universe, which of course contained the same mass and energy, obviously sardined into a smaller volume, and it's image arrives from all directions, along an expanding sphere, not a sausage. imho. Some photons have already passed us, some are still on the way. *some, wrongly will even argue there was no time period, for anything let alone inflation to transpire before the big bang beginning. I'm informed but not an expert. It may be that inflation is considered where time and space began so don't read too much into my remarks in that regard. The illustration is over time and is just showing how much time has passed since the Big Bang and is showing that space is expanding and at an accelerating rate. The Big Bang happened in a fraction of a second. The Elephant in the room is that the further we look back everywhere, the universe appears to be packed tighter and tighter with galaxies. (see deep Hubble images) so: we are supposedly looking at a bigger sphere then our neighbourhood, but it is more crowded. Going back to the Alma sketches above: The light we see come to us in a spiral pass, from a younger, smaller universe, which of course contained the same mass and energy, obviously sardined into a smaller volume. from all directions. Some photons have already passed us, some are still on the way. The Hubble Deep Space images aren't necessarily showing us that galaxies were more packed together. That's true enough since space is expanding but that's not really what we are seeing in that picture. That's just a long exposure in a part of space that appeared to have little going on. We see t here is a lot going on. We can only see galaxies in that image because single stars would be too faint to see. Fair enough. In the big picture, even if the universe would be infinite spatially, as you mentioned, we would not receive photons older than the beginning locally . Our horizon is 13. some light years. Kudos to those that allow us to look nearly that far. PS: I do not think there is an argument that the early universe was a denser, smaller place place. When and how it expanded still under investigation. One thing we know, it expanded through time, one second at a time.